What a field day for the heat: Yesterday up to 3 million people joined demonstrations across France to repeal or reform the CPE--a jobs-creation bill enacted in response to the last November's riots. One of the provisions of this bill is that people under 26 will be able to be hired on a provisional basis for up to two years, and (this is the part people don't like) fired without reason or notice. The rest of the world shrugs; that's just the way business is in America, for example. But in France, it's very hard to fire anyone, even for incompetence--a job is pretty much for life. (This is one of the factors leading to the famous French customer service culture, in which the customer is almost always wrong and why should the employee care anyway [shrug].) So the fear is that young people will get hired, used for two years, and fired without reason. This law affects me not at all, and it is remarkable how little the extensive Mardi Noir (black Tuesday) day of action affected me. Here in Lyon, steady rain kept the numbers down at the protest in Place Bellecour. I did see a loudspeaker car drive past on Cours Albert-Thomas, but not much else. The most visible sign of the protest was that the Metro was closed, except for the fully automated D Line, which soldiered on in silent disregard for its children's workplace rights. So I dragged a bike from the cellar of our townhouse and pedaled to work, about 30 minutes, in rain and heavier-than-usual traffic. I wasn't late for work but I was sweaty and damp. The papers today called the protests a success (of course, I read Le Monde, which leans slightly left, rather than Le Figaro, the Fox News of France). Interesting contrast with CNN's take on the events, which focused on the sporadic violence in Paris. Funny stuff: the protesters are mainly petit-bourgeois college kids, and when the protests reached the banlieus (where I presume they hoped to gain support among their opressed brothers in the housing projects) the locals made the best of their opportunities by...mugging them. Most of the police assigned to the protests ended up protecting the protesters from these casseurs (literally, "breakers") rather than protecting the city from the protesters. But I guess you can't make a good story without some shots of the cops cracking heads. I got my bank account today, so the wheels of capitalism grind on (greased by the blood of the worker, etc., etc.). You've weathered your first native uprising! Good for you! Amazing how small world events seem even/especially when you're right in the midst, what? 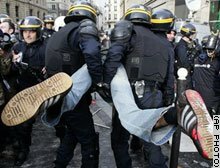 It's not that the Parisian protests are particularly interesting, it's just that they're happening to the French and M. Villepin in particular. Not only that, they like Jerry Lewis.